The description field is particularly subjective. This text is more for site visitors than for searchability, but the words in the description field are indexical, and it is important to be as thorough as possible. For each item type, there are specific details that must be included in the description. Give the date and publisher (with date used as adjective). For cloth-bound books, you should always list the embossed cloth grain type. If this has not already been listed in the book’s bibliographical analysis on our project server, then look up the grain type at The Library Company of Philadelphia’s grain identification page. 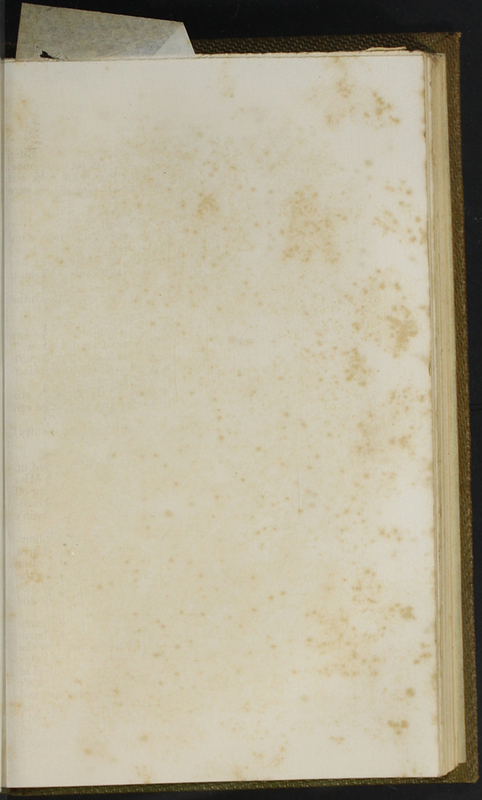 Add the cloth binding information (labeled with the Library Company reference in parentheses). Describe the front and back. A glossary of useful bookbinding terminology that may come in handy for your descriptions can be found at Publishers’ Bindings Online. If the covers are of a specific aesthetic style, then note that with an adjective. In the above example below we use the word “ornate” because there is no discernible aesthetic style. Publishers’ Bindings Online has a helpful resource for evaluating aesthetic style. This 1852 T. Nelson reprint is covered with a red wave grain embossed cloth (labeled Wav3 by the Library Company of Philadelphia). The front and back covers have an ornate, blind-stamped border. 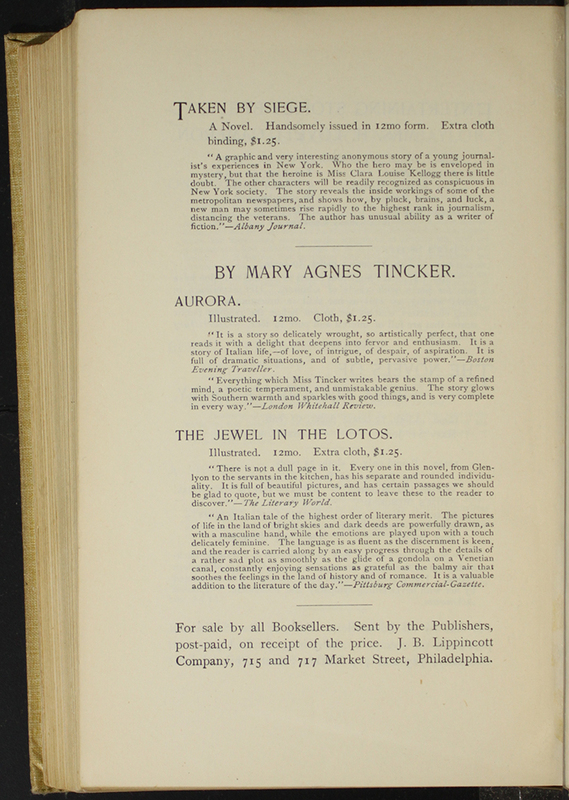 On the front, the centered title and author’s pseudonym are gilt-stamped and accented with ivy. The title and pseudonym are repeated on the spine within a gilt-stamped ivy border. Note whether there is any gilding or edge coloring. Note if any rounding is evident when describing fore edges. Describe end bands if there are any, including whether they are sewn in or glued on. Mention any visible ribbons used by a reader. This gilt fore edge of the 1888 J.B. Lippincott Reprint shows no signs of spine rounding. Follow with a description of the paper type and quality, including any marbling, printing, or special decoration. For information about specific pastedown styles during the period, see Allen, Sue. “Floral-patterened Endpapers in “Nineteenth-Century American Books.” in Winterthur Portfolio, 12 (1977): 183-224. (available on the LibGuide). Note that with few exceptions decorative endpapers (especially between 1870 and 1900 were printed using lithography). If a prize plate, inscription, or binder’s ticket appears on the item, be sure to transcribe it and describe it in full. This front pastedown, from the  T. Nelson and Sons reprint, is sage green with a cream lithograph print of small flowers and leaves connected by stems. 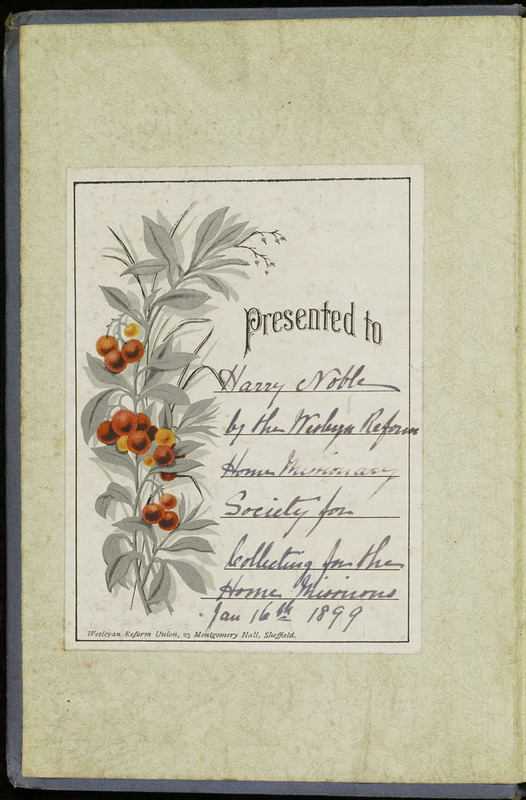 A prize plate is pasted in presented to “Harry Noble by the Wesleyan Reform Home Missionary Society for Collecting for the Home Missions Jan 16th 1899.” The plate has a lithograph print of holly berries and leaves with a plain black ruled border. The address for the Wesleyan Reform Union, “23 Montgomery Hall, Sheffield,” is printed at the bottom of the plate. Use the following format for describing illustrations, frontispieces, and title page vignettes. You may have to do a bit of digging around for your descriptions. Use the advanced search functions in Omeka to determine if this is the first time the illustration has been used. If not, be sure to reference its first appearance. Use parentheses to note the unique identifier of a book that has a relationship to a book you are describing. 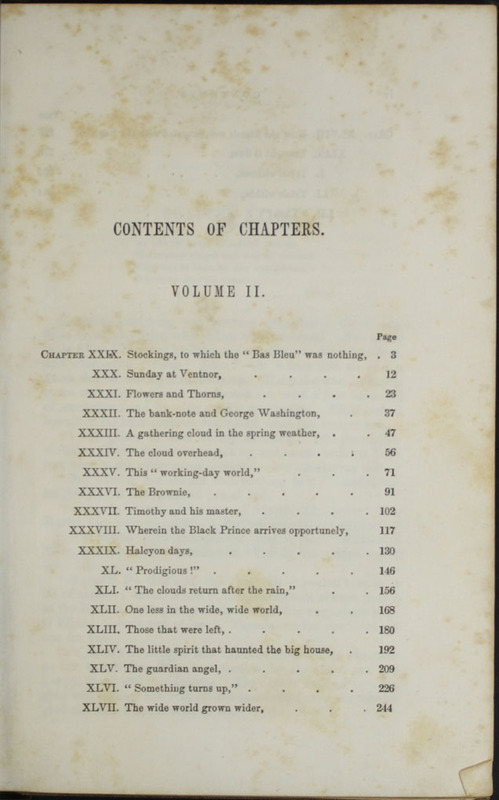 For example: This title page vignette was first used in the 1853 James Nisbet “Author’s Edition” reprint (see 3WIS). If the illustration is of a commonly depicted scene, you may need to describe how this illustration fits into that wider context. For example, if you were describing one of the many illustrations of the brook, but the illustration you were working with didn’t have Ellen crossing the brook with Nancy waiting on the opposite side, but instead depicted Nancy finding Ellen at the brook, it would be worth mentioning this variation. For example: This is one of only two of the eight illustrations depicting the brook that does not depict Ellen hazardously crossing the water on a log. Also, be sure to discuss any relevant information concerning captions and the scene which the illustration is illustrating. In the example below, for example, the frontispiece is illustrating a particular scene near the end of the book, but that may not be obvious from the illustration itself. You may have to do some digging in the text files to answer these questions. Sometimes the same illustration is used to illustrate different scenes in different versions of the book; this is another important detail to mention in your descriptions. Make sure to discuss backgrounds, colors, and objects significant to the story. Make sure to write out any image captions. 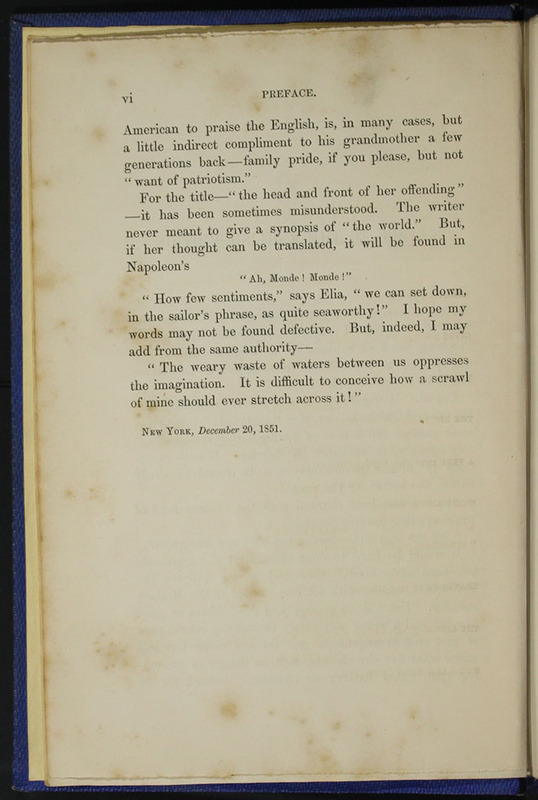 The last sentence should include the page number upon which the scene depicted appears in that edition of the novel. 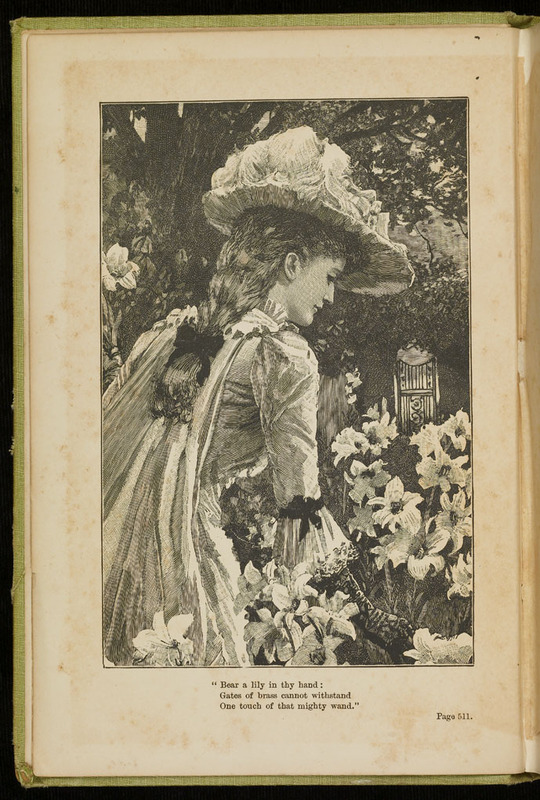 This illustration, appearing as the frontispiece to the 1896 Hodder and Stoughton reprint, depicts Ellen in a flower garden. The caption is a stanza from Henry Wadsworth Longfellow’s 1842 poem “Maidenhood.” There is a reference to page 511, the first page of Chapter XLVIII, during which Ellen and her Uncle Lindsay tour Edinburgh. In addition to being quoted in this caption, Longfellow’s stanza appears as an epigraph to the chapter referenced and to the novel as a whole. The image portrays Ellen within a lily patch, positioned in a demure stance with her head bowed, and emphasizes Ellen’s purity while reinforcing her connection to the divine. The gate in the background refers to Longfellow’s verse and to Biblical “gates of brass,” broken down by an Old Testament God (King James Version, Ps. 107.16 and Isa. 45.2). 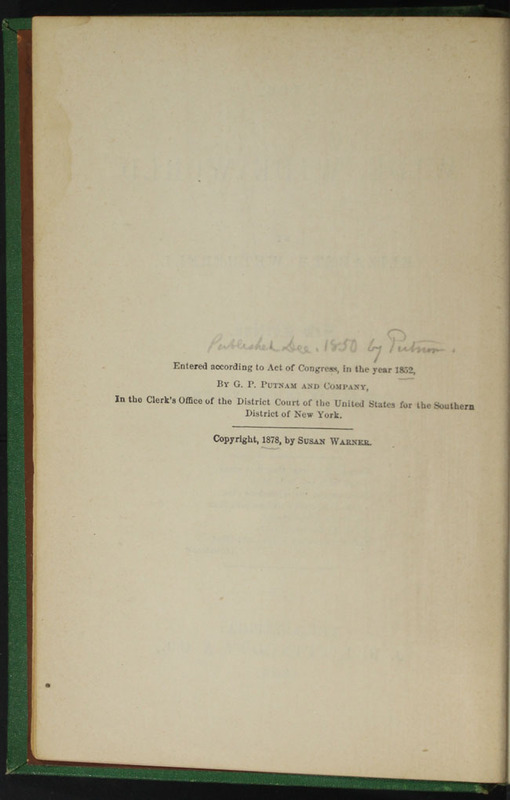 Note position of title on page. Comment on the typography: identify the typeface and font. 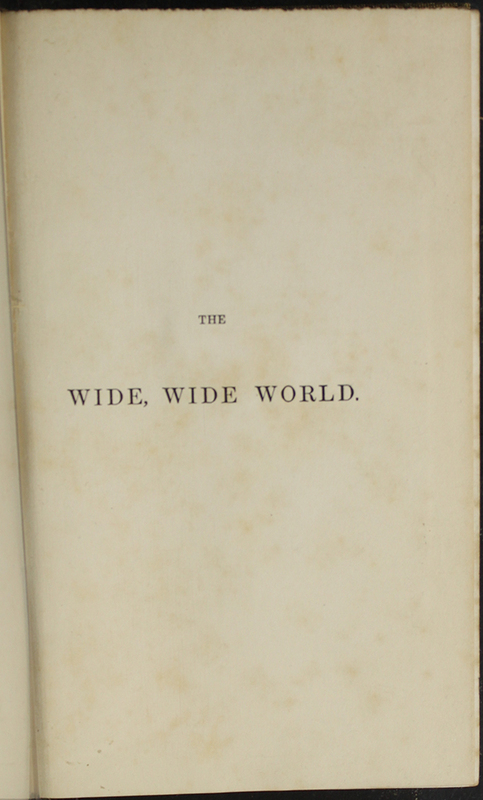 The half-title page to the 1853 George Routledge and Co. Reprint includes an all-caps centered title. Move from the top of the page to the bottom of the page in the description. List the publisher’s name in your first sentence. Mention any unique details of the design, such as a period at the end of the title. Specifically mention whether the author is listed as Susan Warner, Elizabeth Wetherell, or something else. If there is an inscription, explain which one is used and where it appears on the page. Make sure to include the publisher’s address. Make note of whether or not a date is included. If the first page of text contains an epigraph, state its source. Describe the size of the text. Check previous pages to verify whether the advertisements on the page are stand alone or a part of a grouping of advertisements marked with headings. Indicate, where the page of advertisements appeared, which page the advertisement is, and how many pages it is out of (e.g. one of four advertisement pages at back). This is the fourth page of a series of stand alone advertisements for Lippincott publications at the back of the 1892 J. B. Lippincott & Co. Reprint. This blank, which appears on page 372c of the 1853 G. Routledge and Co. reprint, precedes an illustration depicting Mr. Van Brunt’s accident. Letter descriptions should include the names of the correspondents and a detailing of the contents. If a date is included, it should be provided in the introductory clause in the form of an adjective. This fan letter, sent to Warner from a Derbyshire woman, Mary Barnes, spoke of the intimate connection that developed between Warner and her readers. Barnes critiqued the women in her own country for their inadequacies compared to the ideal characters Warner developed.